More Than Gourmet Launches "Soup Season"
SAN ANTONIO, TX--(Marketwired - Feb 10, 2014) - More Than Gourmet, an online food vendor specializing in authentic French sauces and stocks, has officially launched its newest promotion, playfully titled "Soup Season." 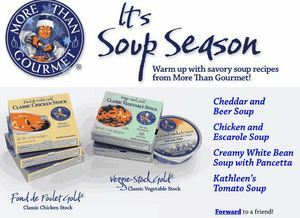 As a part of the promotion, More Than Gourmet is offering up a variety of homemade savory soup recipes, all of which incorporate the company's proprietary stocks and sauces. Just a few of the recipes featured in "Soup Season" include: cheddar and beer soup, chicken and escarole soup, creamy white bean soup with pancetta, and Kathleen's tomato soup. More Than Gourmet is also offering a special discount on its multi-pack stock combinations. Customers who order these packs between February 12 and March 4 will receive 15% off their order. Current stock choices include: beef, chicken, vegetable, brown, veal, venison, roasted lamb, roasted turkey, roasted duck, seafood and more. In addition to its wide array of stocks, More Than Gourmet also offers authentic French-inspired sauces and glazes, such as the Classic Demi Glace, Mushroom Essence, Fish Fumet, Classic Rendered Duck Fat and French Veal Demi-Glace, as well as several gluten-free and vegan options. More Than Gourmet is based in Akron, Ohio, and boasts a team of seasoned culinary experts and professionals. Its products use only the best ingredients and are created using time-honored French cooking techniques. In addition to its product offerings, More Than Gourmet also offers a plethora of resources for professional and at-home cooks, including videos, tutorials, recipes, cooking tips and more. To learn more about More Than Gourmet or to take advantage of the company's "Soup Season" promotion, visit www.MoreThanGourmet.com now.